You can render one or more selected regions on audio or software instrument tracks into an audio file, including all active plug-ins and automation data. Select one or more regions on an audio or software instrument track. Choose File > Bounce > Regions in Place (or use the corresponding key command). Control-click the selected regions, then choose Bounce Regions in Place from the shortcut menu. Name field: Enter a name for the bounce file in the field. The name defaults to the region name of the first selected region, with the extension _bip added at the end. 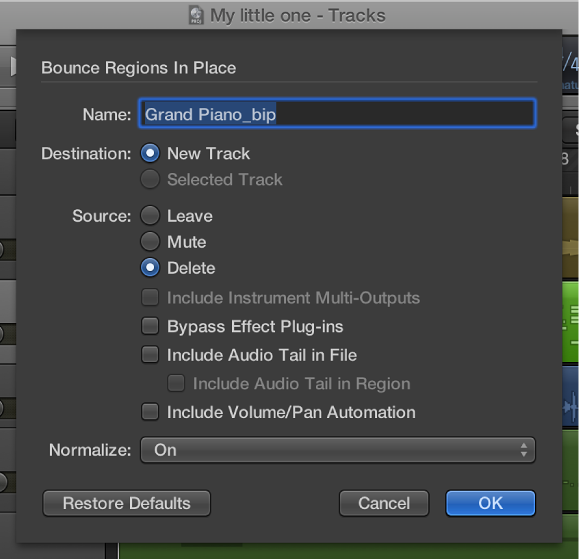 Destination buttons: Define the track on which the bounce file is placed. You have two options. New Track: Creates a new audio track below the selected track, and places the bounce file on that track. Selected Track: Places the bounce file on the selected track. Leave: Leaves the source region unaltered after processing the bounce file. Mute: Mutes the source region after processing the bounce file. Delete: Deletes the source region from the original track after processing the bounce file. Include Instrument Multi-Outputs checkbox: Select to include aux channel strips with multi-output signals of the instrument in the bounce process. Otherwise, only the channel strips of tracks with selected regions are bounced. Bypass Effect Plug-ins checkbox: Select to disable all plug-ins on the source track during the bounce process. Add Effects Tail to File checkbox: Select to continue the bounce process after the end of the bounce range—either to the end of the cycle or to the end of the last selected region—until there is no longer a signal. Otherwise, only the bounce range is bounced. Add Effects Tail to Region checkbox: Select to include the entire bounce file in the bounce region. Otherwise, the bounce region only includes the bounce range. Include Volume/Pan Automation checkbox: Select to have volume and pan automation performed during the bounce process, with their result influencing the bounce file. Otherwise, the volume and pan automation is simply copied, not performed. Overload Protection Only: Allows downward normalization in case of overloads—levels above 0 dB, which would lead to clipping—but no normalization in case of lower levels. On: Allows full bidirectional normalization. Restore Defaults button: Click to set all parameters in the dialog to their default settings. Click OK to trigger an in-place bounce of the selected region or regions. Note: When you click OK, the settings chosen above are stored in the preferences and recalled when you next access the Bounce Regions in Place function.